twitchquotes: As Jeff Kaplan stares at me through my computer screen, I begin to contemplate reality. What truly has substance in this realm of technology, avarice and sin? What is our future, if not a blank, hollow nothing, rife with silence and strife? Only the chosen o DoritosChip ne can stack the doritoes one by one can you st DoritosChip ack the doritoes like a man or cry like a little baby DoritosChip scrub. 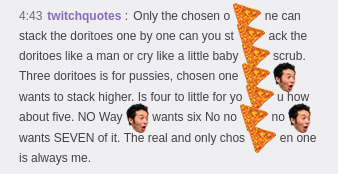 Three doritoes is for pussies, chosen one DoritosChip PogChamp wants to stack higher. Is four to little for yo DoritosChip u how about five. NO Way PogChamp wants six No no DoritosChip no PogChamp wants SEVEN of it. The real and only chos DoritosChip en one is always me. twitchquotes: isn't so great? Are you kidding me? When was the last time you saw a meme with such influence and beauty in Twitch chat? takes Twitch to another level, and we will be blessed if we ever see another Twitch meme with the same level of memeness. Unite my Twitch brothers! We will forever sing in the old Jewish hymn: "Kappa outdated. overrated. Long have we waited. Now we Jebaited." Jebaited isn't so great? Are you kidding me? When was the last time you saw a meme with such influence and beauty in Twitch chat? Jebaited takes Twitch to another level, and we will be blessed if we ever see another Twitch meme with the same level of memeness. Unite my Twitch brothers! We will forever sing in the old Jewish hymn: "Kappa outdated. PogChamp overrated. Long have we waited. Now we Jebaited."